Home » Blog » Can Creationism Go on Forever? Can Creationism Go on Forever? 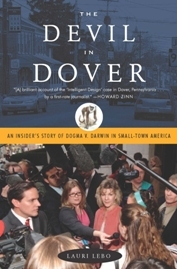 AlterNet has just posted a review I did of Lauri Lebo’s The Devil in Dover, an account of the 2005 evolution trial in Dover, Pennsylvania. It was a real treat to do the article, since I wrote my college thesis on the Dover trial while it was going on. As another round of my usual spats with editors about titles, I’m not at all comfortable with the title AlterNet used, “Despite Overwhelming Evidence, Creationists Cling to Unreality.” In my thesis and in my review, I have tried to operate under the assumption that creationism feels like a reality, replete with evidence, to those who adhere to it. I only feel silly claiming that my reality, which they have yet to accede to, is the one with a capital R. All I claim in the article is that the scientific consensus is evolutionist, and that’s what we should teach in science classrooms. Making metaphysical claims isn’t the point. This entry was posted in Blog and tagged books, evolution, language, religion & science. Bookmark the permalink. Is there a statistical correlation between areas which teach ‘intelligent design’ and poor performance in science/math? You’re right to point this out—I haven’t seen a correlation like this specifically, though that doesn’t mean one way or another that it doesn’t exist. In recent tests, the countries that did the best were Finland, Hong Kong, Singapore, Canada, and Taiwan. You would know better than I whether most of those countries teach creationism. Anyway, I’m not sure it would make such a tremendous difference. It depends on who is writing the tests. If Richard Dawkins is writing them, yeah, creationist kids might run into some trouble. More what I meant to draw out with that remark is the sense in which, when good science is the priority (as in the period after Sputnik that I mentioned), leading scientists get asked to design good curricula. The lot of them disagree about many religious questions, but they tend to agree that some kind of evolution-by-natural-selection theory best fits the data. “The student,” then, has taken an interesting role in how these controversies unfold. Some argue that creationism is teaching students to hate science, while others say it is making them more engaged by connecting it to the love of their creator. Some say “teach the controversy” and let the students decide. I guess I am assuming the former here, and may be assuming too much in doing so. When I referred to a correlation between ‘intelligent design’ teaching and poor performance in math and science, I meant between different regions in America. This would be easier to extrapolate then between different countries with entirely different curricula and it would be near impossible to isolate this one variable. For my own part, I’m not sure if the debate negatively impacts science education or acts simply as a sideshow which distracts persons from spending the time and energy necessary to *improve* the quality of science education. In the end, I’m not sure if the problem has anything to do with the curricula (would a star-studded cast of Nobel laureates necessarily be any better at designing elementary and high school curricula than those currently doing so? ), or with the attitude of the students, which is a separate but not unrelated question to your whole line of inquiry. Also, I think the strong argument of the ‘intelligent design’ folks (I always attempt to present/debunk the strong argument of my interlocutors where possible) is that scientific education undermines moral education. One supposition might be that ‘fundamentalist’ moral education is better than no moral education. WJ Bryan I think argued to this effect in Scopes, although it has been awhile since I read anything on that and I could be mistaken. Doing such a study in the U.S. seems like a tricky thing. Public schools are not legally allowed to teach creationism in science class. Private schools are their own issue. Evolution is such a limited part of the curriculum in high schools anyway that I suspect socio-economic factors would far outweigh something like this. But perhaps a good statistician could figure out how to make the correlation. I’m glad you brought up the question. I totally agree with your statement about the sideshow stuff, and that’s the position I’ve always tried to take on the subject. Rather than joining one side or the other (though clearly I have a favorite), I try to point out ways in which the whole thing is a distraction for science education, while also being an interesting American cultural tradition. What I know about WJ Bryan is his deep concern with the really bad outgrowths of evolution in the early 20th century: eugenics, social Darwinism, and fashionable nihilism. At least in the forms they had then, these things have passed somewhat in the time since. For his time, I have no doubt that Bryan had the best intentions at heart and I respect him for it. But in some respects, his problem was the perennial one; in the courtroom in 1925, he managed to prevent any scientists from testifying. They were simply not allowed to speak. Rather than trying to think about what to do with new scientific ideas, he believed they had to be repressed entirely. He was wrong; as you point out (I think), moral education is possible even in an evolutionist context. I have no idea how to do such a study; it may be both infeasible and a continuance of current distractions. Certainly moral education is possible even in an evolutionist context — the question is ‘What education?’ How can we measure the worth of various possible moral educations independent of a inerrantist reading of the Jewish-Christian texts? Or can we at all? I’d say that question remains very much unanswered and contemporary measures for such are more often than not quantitative, which usually means economic. Of course, there is also the Aristotelian approach, but I am unaware of any compelling recent formulations of natural law. Are you? These are cans of worms, all right! Alistair MacIntyre offers some tools for worldview comparisons in Whose Justice? Which Rationality that might be what you’re looking for. I understand that it involves asking which tradition can best account for the strengths and weaknesses of the other. I haven’t thought about these much in detail, but lots of other people have found them useful. I’ve especially seen this work used by Christians to knock secularism. I suspect, though, that the real evaluation comes down to something more organic. The guru of American secular education, John Dewey starts “My Pedagogic Creed” by writing: “I believe that all education proceeds by the participation of the individual in the social consciousness of the race.” There is a basic truth in this, I think. People teach their children morality and the rest in the hopes of continuing and advancing what they know and the society in which they live. They want to equip the child to share in the same society that they do—or perhaps an improved version of it. I’d argue for a certain relativism in all this—objective evaluations of different education schemes are as difficult and distasteful of evaluations of human cultures generally. And how can they be but economic? Even the Christian model is economic, in its way—an economy of salvation. Secular approaches to natural law are tricky because there is no agreement that there is even a lawgiver. Rather than natural law, I suspect the approach is more like natural landscape: how to deal with what we know about human nature (complex and non-uniform as it is) and the natural world. A theory like Rawls’s Theory of Justice would be one of these. It doesn’t ask what the natural law is once and for all, only what a workable meaning of fairness might be. The funny thing about children is they don’t seem to learn by memorizing laws as such. They learn by imitating their parents and their community, by absorbing the values they see there. Moral education, then, is: being a member of one’s society in front of one’s children. I’ve read some MacIntyre but not that book; will attempt to consult when time allows. Philip Rieff argues that societal morality (which he argues has devolved considerably) cannot exist without a re-imposition of authority figures. It sounds like you would disagree about the devolution but does not your impression of what is and is not ‘distasteful’ as you put it, amount to a sort of canon claiming some degree of objectivity (or perhaps simply detachment from traditional societal norms) ? If so, I would argue that it to some extent is derivative of what I call the anti-narrative — the promulgation of which has become the new telos for the Dewey-founded ACLU. If this is ultimately what your ‘relativism’ amounts to, I’d have to say I am unconvinced that it is sufficient replacement for the inerrantist bible-derived morality mentioned in previous comments. I agree about the general dynamic for the passing of cultural-memes, which of course includes morality. However, I’m not sure how it can be rehabilitated in a society which is no longer race-based (although everywhere those than can self-segregate do, the Jewish religion especially combines both aspects). This of course leaves what Dalrymple calls the ‘underclass,’ the plight of whom is usually ignored by social-programmers. I apologize if I am entirely deconstructive but I believe our ability to find answers is ultimately contingent on our ability to admit that we don’t have them, which may in a sense be Christian. The re-introduction, or at least more precise definition of moral coda, seems especially important in the current era, as the new wave of evangelical atheists claims that morality can be built off evolutionary science — in this respect we may remember the results of the German National Socialist’s stated reliance on race-science in their social programming. Although I have minimal populist inclinations, I can understand well the passions that drove WJ Bryan if this is what he believed would be the outcome of the social-scientists’ deconstruction of social norms. The whole Socrates-Alcibiades saga also comes to mind. This is a wonderful statement! I would agree that it overlaps with things that have been said in Christian traditions, and I would add that it overlaps with things that have been said in other traditions as well, from secular scientism (particularly the skeptical fringe) to all over Asia. Apophatics are everywhere. They offer good reminders, but often not that much that’s practical. I’d love to talk more about Rieff sometime. I haven’t read the recent stuff, but I did recently get a lot out of The Triumph of the Therapeutic. It is amazing warning about the tendency of post-religious folks to think they can control the forces beyond our control. Yes, what I call “distasteful” does come from some canon, and I don’t pretend not to. How can we not? In this case, what that canon suggests to me is the urge to suspect one’s own claims to objectivity. This has been a delightful exchange. Do you mean Alcibiades in Symposium? Or in the apocryphal dialogs by his name? Why does it come to mind? I’d like to do some more Rieff reading myself. I encountered summaries of his early works by way of some friends and am currently in the middle of Charisma. Sure, this can amount to making no claims, making weak claims, or making strong claims and admitting the possibility they are wrong. I tend towards the third option — but always appreciate criticism! BTW, how do you italicize something. These fields take HTML tags? Thanks for the link—I actually re-read Euthyphro last week, so that connection helped. And it is true, the deconstructive act becomes a destructive act in its extremes. There is no choice but to exile it. That’s why I think the idea of tradition is so vital. It binds us (restrictive) and connects us (permissive) and becomes a medium in which to operate. Catholic ecclesiology comes to mind, as does Jeffrey Stout’s Democracy and Tradition. My tendency is the middle one, making weak claims. But I am finding that the more criticism I get, the less I feel the need to hold back from making stronger ones. Yes, I think the comment field is the standard WordPress HTML editor. It is a little arbitrary. It accepts most HTML tags (including em tags for italics) but it also does nice things like converting three dashes to an m-dash. Well, in both cases the deconstructor was killed or sentenced to death. Semi-unrelated, have you read Charles Taylor’s VRE Today? Revisits WJames with a Neo-Durkiemian lens — seems up your alley. Yup! That’s a good one. I’ve got it right here. I’m ashamed to say, though, I still haven’t read A Secular Age. Even though I work for a blog that takes its name from it! Thanks for passing these along. I sure hope that this “eonic effect” can change the subject for the better someday. In the case of Dover, specifically, you might understand the ruling better by taking a closer look at the “intelligent design” theory that was at issue. You are right that Johnson’s Darwin on Trial was important to its genesis—it was with that book that Johnson became a player in the whole thing to begin with, rather than simply a Stanford University law professor. The trouble was what followed. Under the guise of the Discovery Institute, Johnson and his compatriots carefully and purposefully crafted intelligent design as a new version of creationism that could slip its way past the First Amendment. The evidence for this is most compellingly in The Wedge Strategy, a secret document of theirs that was leaked on the internet. See also Barbara Forrest’s book, Creationism’s Trojan Horse for a fuller explanation of what happened. Even if evolution as it is currently taught is not the best and fullest explanation possible (certainly it is not), we should not want to replace a functioning scientific theory (however imperfect) with an illegal public relations strategy that has no content except confusion. Thanks for the comment. I will link to it at the essay and my blog. While I share the reservations about ID, I don’t find the obsession with natural selection on the part of Darwinians to be all that scientific either. The near cult religion on selectionist Darwinism should not be crammed down students throats in the name of religion-free science. We need to hear from the scientists whose critiques were purloined by the religious groups, ID-ists among them (a good example being Philip Johnson’s book), e.g. Robert Wesson, Beyond Natural Selection, or an older developmentalist like Soren Lovtrup, Darwinism: Refutation Of A Myth. The purpose of the article cited about the eonic effect (‘let’s change the subject to the eonic effect’) was to change the subject to history, and to suggest a different way out of the intractable debate: a Kantian discipline to challenge both parties to a concealed metaphysical debate. In the final analysis natural selection has been made into a talisman of metaphysics and parents have a right to protest the indoctrination of their children by the type of half-educated technical specialists who have themselves been ill-served by the Darwinian PR disguised as science education that currently reigns. A kind of Kantian neutrality, ‘nobody gets nothing’ as to theories, might help to enforce the discipline of what we don’t know. Meanwhile, consider if Toynbee were made the man who ‘answered all the questions about history’, and were made obligatory in schools on the basis of science. We would protest to leave history alone, and keep it the diffuse study that it in fact is. A similar approach ought to be as obviously necessary for the study of evolution. Most students of science are visibly confused about their own subject matter because of the Darwin straightjacket thrust upon them. Scientists are very contemptuous of religious people, but their own poor training makes them as bad in their own way.